Many, many ePharma Pioneers -- smart people who have long evangelized "e" for pharmaceutical marketing communications -- keep up the pressure on the pharmaceutical industry to get more involved with social media marketing. I have documented this in many of my posts to Pharma Marketing Blog (see here) and in Pharma Marketing News articles (see a compilation here). "There is no need for pessimism about the ability of pharmaceutical companies to use social media in their online marketing mix. The common belief is there are too many regulatory hurdles around reporting adverse events, presenting fair balance efficacy information, and avoiding endorsement of off-label usage. While it certainly isn’t as simple for pharma as it is for CPG, technology or entertainment marketers, many drug companies are beginning to use social media very effectively." Maher has some good advice and examples of how pharma marketers can get involved with social media. His examples, however, fail to impress me because all the sites are either run by non-pharma third parties (iguard, cafepharma) and are not product-related (except for the OTC alli site, which seems to have an authentic online community bulletin board). There are no lessons here for marketers of branded Rx products who wish to set up product blogs and such, but who shy away from doing so because of "regulatory hurdles around reporting adverse events, presenting fair balance efficacy information, and avoiding endorsement of off-label usage." If, for example, Pfizer were to set up a blog about fibromyalgia and Lyrica -- its drug for the treatment of fibromyalgia -- it would open itself up to the receipt of adverse events submitted by self-identified patients. Pfizer would have to report all these to the FDA even if they did not publish the comments in the blog. The marketers of alli are not concerned with adverse event reporting because its not required for OTC products like alli. Pfizer does not have a fibromyalgia or Lyrica blog, but it does have an unbranded Web site called "FibroCenter," through which it solicits open-ended "Shared Stories and Tips" from visitors. This is interesting because there's a form on the site that allows people to just tell their stories, adverse events and all. Perhaps Pfizer is not concerned about AEs because most people filling out these forms want the reward of being mentioned on the site and they are not likely to mention side effects. "I grant my consent to use my name, biographical data and relevant medical history by Pfizer Inc in any Permitted Use identified below. Pfizer may at its/their sole discretion make any and all changes in, additions to, and deletions from the story and/or tips in 'Share Your Story and Tips.' Such alterations include, but are not limited to cuts, edits, additions, changes, rearrangement, adaptation of the story and/or tips to different formats, and other changes, additions and deletions necessary to make the 'patient testimonial' commercially viable [my emphasis]. With reference to the alterations referred to above, I hereby waive any and all claims I may now or hereafter have to the rights of integrity, disclosure and withdrawal and any other rights that may be known as or referred to as 'moral rights.' I understand that the selection and editing of the portions of the interviews to be used for any purpose shall be in the sole discretion of Pfizer Inc. "
I don't have a problem with this -- Pfizer is not claiming this is a social media site where patients can tell their stories in their own words. It does, however, give me some insight as to why pharmaceutical companies are not ready to do that. It is obvious that in a top-down organization such as a pharmaceutical company, there is a great need to "control" the stories it publishes, and not just because it has to obey regulations. The stories have to made "commercially viable." I suspect this means that everything in the story must be consistent with Pfizer's marketing goals, which makes sense from a commercial point of view. But this is precisely why most companies -- and not just drug companies -- will never fully embrace true social media, which calls for unfettered and unedited user-generated content. 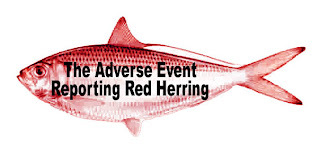 It has nothing to do with adverse event reporting -- that's just a red herring. As a patient, I can choose to disclose my medical records or history to anyone, essentially setting aside the HIPAA privacy/security rights that providers/payers must follow wrt my records. Why can't I similarly, as a patient, waive my right to have a pharma company comply w/ AE rules/regs before posting to a public pharma sponsored education oriented social network? Still requires some judgment by patients to understand that wisdom of non-medical crowds regarding pharma issues may be wrong more often than right. I don't believe you can waive a requirement imposed upon a third party by the FDA. You can only waive rights that you yourself own. You have the right, for example, not to mention adverse events when posting to blogs. BTW, your adverse events, if they are part of your patient record, are not owned by you -- your entire patient record, including adverse events, is owned by your doctor. Great post, every time someone mentions the regulatory hurdles and pitfalls of social media with pharma I look for rain, but it is just someone peeing on my leg. It drives business executives and marketing managers crazy that they don't have a level of control over their message. The idea of sponsoring something that might not show them in a positive light is not a great risk/reward proposition at this point. Secondly, being an e-marketing manager and trying to sell these initiatives internally is not fun at all. The time and effort it takes to educate and sell people that have never been on a social media site is immense. I don't blame companies for not taking the plunge into social media, but LMR is not a good enough reason. Regarding Tom's suggestion that a site visitor might somehow "waive" the responsibility to report an AE, the responsibility is not the site visitor's to dispose of. The pharma company, in getting permission to market an Rx drug, incurs the responsibility to keep its information reasonably up-to-date. This does not mean tracking every single wrinkle in the medical literature, but it does mean responsibly dogging down AEs. As I understand matters, a pharma company does not have to report every stray anonymous gripe and complaint; however, it does have to make reasonable efforts to find out the truth about those gripes, and report the ones that have substance. Thus, it's understandably not great business practice to invite casual anonymous complaints, which you then have to spend staff time and effort to investigate ... UNLESS there's a reasonable benefit that merits that expense. We who do believe in the merits of social media need to make the case that the benefit is worth the expense. Having worked in Pharma PR for the past 10 years and currently experiencing the change that Pharma companies are trying to embark on related to social media, AEs are usually the first thing that trips up the legal and medical folks. However, as you mention it goes beyond AEs and into the area of controlling the message. Most Pharma is old school and the industry is one of the slowest to employ change in policies and procedures and this includes the ability to control the message. This is especially the case for an area like e-communications/social media that is not regulated by the FDA and because of this, eminent change is sure to continue at a snails pace. To your point, I agree that most Pharma companies will likely never truly embrace social media. Some companies have dipped their toes into the water and we should applaud them (as you have in previous posts) for at least trying, even if it's for unbranded initiatives. Lastly, I think it's a stretch to say the marketers of alli are "not concerned about AEs." I’m sure it’s in any company’s best interest to report AE trends if they see them, regardless of requirements. Whether they do or not, who knows. Actually, I found some info on new requirements for AE reporting even for OTC products. Here's the link: http://www.fda.gov/cder/Offices/CRMS/ADE.htm. Seems that this may be limited to serious AE reporting (e.g., death, life-threatening situation, etc), but it's tough to tell from a quick read. Keep in mind, alli is one of those tricky OTCs that is actually FDA approved. Because of this I wonder if the manufacturer may further be required to report AEs. So ok. Here's the deal, at least part of it. Companies have legitimate regulatory hurdles to social media, particularly anything in real time (like comments) and even blog entries themselves. Here's why. Its not so much AE reporting. There are some issues here, but as you point out there are plenty of situations that already exist for which the company solicits patient stories or allow direct communication to the company (like providing any information or help lines or requesting patient testimonials, to name a small few). In each of these cases patients have the same opportunity to mention a reportable AE. Nuff said about that. Here's perhaps the biggest practical problem if you have a prescription drug or biologic. Posts or comments in any blog that end up having product mentioned or discussed causes that blog, or at least that post, to be a form of labeling. That means, for most companies, that that content needs to go through a medical, legal, regulatory review before dissemination. More importantly, labeling (in this case promotional labeling) and advertising must (and I mean must) be submitted to FDA on what's called a 2253 form "at time of initial dissemination" according to the regulations. This requirement in and of itself makes it near impossible for companies to do any real time blogging related to any of their products, and also requires them to pre-review comments on a pass-fail basis. Companies have (and have to have) processes that ensure prior review of content for compliance with complex promotional regulations and a process to ensure that the content is submitted to FDA at least simultaneous with the posting (if not before). You also have to set expectations with the audience that are sure to disappoint. For instance, patients or readers will want to engage in discussions that just cannot be had in this context (asking for medical advice, making outlandish statements about product effects, or asking any number of questions that can't be answered on the blog). Further, patients think they may be doing something great by testifying to how your drug solved all their problems, gave them a new life, new personality, made them wildly successful in their love life, etc., but if you leave that comment up, FDA could say your blog makes unsubstantiated claims (and you get a warning letter). All that said, companies could do a lot more than they are doing, but it takes a dedicated approach on the part of the regulatory and legal group to review stuff and to approach new media with a creative, but compliant approach. Marketing and communications people also have to make a noble attempt to "get" the regulatory issues rather than try to steamroll them. I'm tired, I could go on forever about this. Point is, companies will always suffer in their authenticity, but they should try something, get their feet wet. One final thought though. Social media is really helpful to regulatory professionals like me. I use multiple blogs, like yours, like pharmalot (RIP), FDA Law Blog, Food and Drug Law blog, and others to keep on my regulatory toes. Ironic? Also, I'm now a blogger myself, but I'm now self employed and my blog is not regulated content (but it is about regulatory stuff). More irony? Actually no. In fact, social media (I believe) can be a tool (if not a solution) for the management of many regulatory issues (like risk communication) or just to disseminate responsible public health information. event associated with such drug..."
Such an event is not likely to happen with a product like alli, which, when it was an Rx product, went through rigorous clinical trials and was sold as Xenical on the market by prescription -- so there was real-life experience with the product, which showed only mild but embarrassing side effects -- definitely NOT "serious" as defined by by law. The only "serious" AE of Xenical was the claimby Dr. Sidney Wolfe, director of Public Citizen’s Health Research Group, that it may increase cancer incidence (some tests showed increased incidence of aberrant crypt foci (ACF) in the colon of rats). alli, the OTC version of Xenical, is a much lower dosage form of Xenical and the known side effects are even less troublesome because of that. As for "serious side effects" -- It is unlikely that anyone would report an AE related to "aberrant crypt foci" linked to the use of alli. Thanks for the feedback John. In the end I think we all agree that despite the hurdles Pharma faces, social media is an area that cannot be ignored. We must continue to educate legal, regulatory and medical folks on how to engage in this space, even if the first step means not proactively engaging in two-way participation. Understanding the landscape, what can/cannot, has/has not been done and explaining it in a way that makes sense to a particular company and its brands is the best way to begin the discussion. Start from the basics and go from there. Historically, information sources provided to American citizens were limited due to the few methods available to the public, such as radio, TV, or news print. And also this information was subject to being filtered and, in some cases, delayed. This occurred for a number of reasons, which included political ones. Now, and with arguably great elation, there is the internet, which can be rather beneficial for the average citizen. Soon after the advent of the internet well over a decade ago, web logs were created, that are now termed ‘blogs’. At that time the blogs were referred to as personal journals or diaries visible on line. As time passed, blogs became a media medium, and blog communities evolved into addressing topics that often were not often addressed in mainstream media, as they crossed previously existing political and social lines. In addition, blogs provide immediate contributions by others, the readers of the posts of the blog authors, instead of the cumbersomeness of opinion and editorial pieces historically and not always presented in such media forms as newspapers or magazines. The authors of blogs vary as far as their backgrounds and intent of what they choose to address on their blogs exactly, just as with other media forms. Some are employed by the very media sources that existed before them. Furthermore, they are not exonerated from the legalities of what is written, such as cases of libel. While we can presume that bloggers like to write, they may not be quality writers, yet several are in fact journalists, as well as doctors and lawyers, for example. But to write is to think, which I believe is a good quality one should have. Regardless, a type of Socratic learning seems to be occurring due to the advent of blogs. Yet presently, blogs have become quite a driving force for those with objectives and issues often opposed by others, and therefore have become a serious threat to others. These others may be politicians, our government, or corporations- all of which have been known to monitor the content of certain blogs of concern to them for their potential to negatively affect their image or their activities previously undisclosed. This is why blogs, on occasion, have become a media medium for whistleblowers, which will be addressed further in a moment. While one disadvantage of blogs is the potential lack of reliability, blogs however do allow in addition to the comments of its readers the posting of authentic internal or confidential documents that typically are not created to be viewed by the public, yet are acquired by certain bloggers. For example, blogger Dr. Peter Rost, a whistleblower himself, not long ago posted a newsletter published by pharmaceutical company AstraZeneca on his blog site, and this newsletter was given to him by AstraZeneca's employees who called themselves the ‘AZ Group of Seven’- with the intent of this group being to bring to the attention of others the illegal activity of off-label promotion of one of AZ’s cancer drugs promoted by their employer. Yet this particular concern by AZ seven, by surprise, is not what caught the attention of so many who viewed the posted newsletter by Dr. Rost and was read with great interest by others. It was instead a comment included in this newsletter that was stated by former regional AZ manager Mike Zubalagga, who was being interviewed by a district manager in this newsletter. Mr. Zubalagga, who in this newsletter posted on Dr Rost's blog site, referred to doctors’ offices as ‘buckets of money’, which caught the attention of several readers. This and other statements by this man were in fact published in this newsletter clearly not reviewed before its publication. . Again, the statement and the newsletter created by AZ was indeed authentic and further validated due to the content being in the written word, which added credibility. Mr. Zubalagga was fired the next day due to this ‘buckets of money’ comment due to the effect it had on the image of his employer. His manager resigned soon afterwards from AZ. Blogs, one can safely conclude, reveal secrets. And there have been other whistleblower cases on various blogs in addition to this one described a moment ago, which illustrates the power of blogs as being a very powerful and threatening media medium of valid information disclosure that others cannot prevent from occurring. This, in my opinion, is true freedom of information- largely free of embellishments or selective omissions. It’s a step towards communication utopia, perhaps, yet a force that has the ability to both harm and protect many others. Yet again, the information on these blogs should not be taken as absolute truth without proof to verify claims that may be made, as with other media sources. Of course, documents that are authentic is an example of a good validation source. And this, in my opinion, is the blog’s greatest value, combined with the comments on blogs from the growing number of readers who are allowed to contribute to the subject matter so quickly, which fuels the objectives of the blogs, which may be a type of Socratic learning. Like other written statements, some on such internet sites are composed with respect of the written word. Others are not. It's the freedom that may be most appealing of this new medium which has the ability to convert citizens into journalists who want to contribute to an issue of their concern they share with the blogger often with great conviction and accuracy. Because we, the public, have a right to know what we are entitled to know and what we want to know. This is especially true if the information disclosed on blogs could potentially be adverse to our well-being. Ignorance is bliss, but knowledge is power. Great post. I work with pharma marketing companies to measure the social media marketing campaigns of drug brands and inform them of online consumer sentiment. I've worked with my software to filter those comments which may contain adverse side effect mentions. I chose to run a social media measurement analysis on the Vimpat brand for treatment of epilepsy related seizures as an internal case study. Feel free to go to http://bit.ly/taOpF to download the data. I can give a more complete report upon request. It is a sampling of consumer generated mentions with sentiment about the product, associated keywords like Keppra and Lacosamide and Zonegran. Additionally I have monthly search volume for the related keywords, actual URLs and profile information of those that made the comments. I'll give the data to you at no cost as our software has already collected it. 1. I've started the new med Vimpat …I'm not too impressed with it…I was much happier off of it. It is starting to remind me of the time I was on Keppra and that was a time I would like to forget. 2. I was also put on vimpat. … medicare isn't covering it …this dose is like 1/5 the cost of the lamictal … and they covered lamictal… might take 2 weeks for the HMO to process the neurologists request…no guarantee that they'll actually cover the meds.